The upheaval of having to move to a care home would mean giving up not just independence, but also their choice of entertainment options, animal companions, social community, and even culinary preferences. With a live-in carer, this doesn’t need to be the case. We are incredibly thorough in selecting our carers, doing full background checks and putting them through a rigorous interview process. Only 4% of applicants end up getting a job with Elder. It is important that our carers are qualified to deal with a range of conditions from frailty to dementia. However they also need to have softer skills such as empathy and compassion. 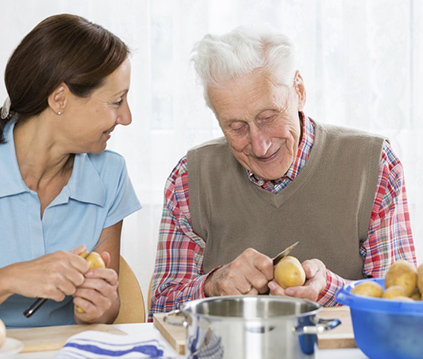 We also understand how important it is that our carers can cook the food that your relative will love. We know how important it is to listen carefully to our client's requirements and match staff accordingly. How do we make matches? Rivendell operates a 24 hour phone line and we are always contactable in case of emergency. Find out how we can help.